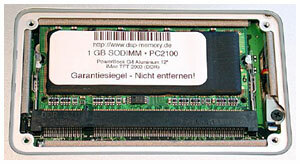 Germany's DSP Memory now offers a 1 GB RAM module for the 12" PowerBook and 17" iMac. The availability of this module means that the PowerBook can now be equipped with up to 1,152 MB of RAM. instead of the Apple specified maximum of 640 MB in the little portable. The modules are suitable for the current 12" PowerBook as well as 17" iMac (2003 model with GDR RAM). Availability will commence shortly. The GDR RAM memory module PC266 costs about € 800. USA Today photographer Jack Gruber is covering the war in Iraq with a 12" PowerBook. You can check out some photos on the Sports Shooter website. Michale Kliehm has posted three tear-down tutorials with lots of photos for the three PowerBook G3 Series models, popularly known as WallStreet, Lombard, and Pismo. Apple has posted a Knowledge Base article explaining how to calibrate your new iBook or PowerBook G4 Lithium Ion battery for best performance. Addapt expands to fit the situation. The core element is a shoulder carrying strap. Choose from the series of clip-on components to make the bag that suits what you need to carry. The five clip-on bags are scaled for different purposes: Travel bag, gym bag, office bag, computer bag, wallet pocket. Willow Design has released five new cases specifically designed for the 17" PowerBook. The three slipcases and two traditional briefcase style cases range from an ultra thin slipcase designed to be slipped into other bags to an extremely protective two level case for the professional with tons of peripherals and abusive usage. The cases are constructed of tough polyester and nylon fabric with 1/2" foam protection throughout, reinforced by combinations of corrugated plastic, high density polyethylene on the handle side and hardboard on the bottom. As with all Willow's other 38 cases specifically designed for Apple products, the new 17" PowerBook cases are covered by Willow's lifetime guarantee against defects in materials and craftsmanship. The Lillooet 17" PowerBook Sylph Slipcase offers the smallest possible package for your laptop which still offers a measure of protection. A front pocket and expandable rear pockets lie flat when not in use but can bellow to carry a couple of inches of accessories when needed. 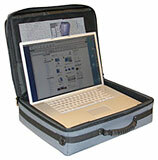 The Clearwater 17" PowerBook slipcase is a lightweight, compact solution for safely transporting your Titanium. Its 'end' opening makes it particularly convenient for those using with a top opening pack. The vertical orientation is also handy to minimize space in tight commuting quarters. The Vermillion 17" PowerBook slipcase offers a lightweight, compact solution for carrying your 17" PowerBook, power supply and cord and some accessories. The stylish design takes up a fairly small space but is expandable to carry more gear when you need it. The Kemano 17" PowerBook Case has been specifically designed to maximize the protection of your 17" PowerBook and to compactly carry the accessories that are a part of your working system - all in a stylish, clean looking parcel. MacMice.com has announced its iTilt riser stand for Apple notebook computers. The iTilt is the least expensive desk top riser stand on the market. With a wide range of adjustability, stable utility, sturdy construction, and a truly attractive design, the iTilt is set to be one of the most popular accessory products of the year. The iTilt is constructed from specially drawn wire, is coated in specifically selected white silicon rubber, and works well with any recent dual USB iBook or G4 PowerBook, including the newest 12" and 17" versions. Just set your PowerBook or iBook into the iTilt, adjust it where you want it, plug in your keyboard and mouse, and you have the best ergonomic solution available - and at the lowest price. The MacMice iTilt is available now from the MacMice.com website for US$12.99. MacMice.com has also announced the release of an entire line of pro-quality VESA standard based ergonomic mounting products for Apple LCD displays, iBooks, and PowerBooks. The various products are being offered under the new ErgoMac trade name and are only the first of what will be the industry's only complete assortment of VESA mounting accessories for Macs and Mac peripherals. The ErgoMac line includes two types of ergonomic mounting arms, a wall mount, and a desk stand. Used in combination with the many MacMice mounting adapters, including the new iGrab mounting plates, nearly any Apple LCD display, PowerBook, iBook, or any of hundreds of third-party Apple-related products can now take advantage of the industry standard VESA mounting system. MacMice.com is the first company to solve a true need in the Mac community for VESA standards based mounting devices, as this has long been a major omission from Apple's product features. All of the new ErgoMac mounting products are available now from the MacMice.com website. Wacom Technology, the world's leading maker of pen tablets, has announced the CintiqPartner, a pen tablet designed to use the Grip Pen from a Cintiq interactive pen display and thereby provide fast cursor control and easy desktop access in multiple-monitor configurations involving a Cintiq. Cintiq interactive pen displays allow users to work directly on the screen with the natural control of a pen. The CintiqPartner complements that capability by allowing the same Cintiq pen to be used on the CintiqPartner pen tablet to navigate on any traditional CRT or LCD monitor. CintiqPartner will be demonstrated for the first time at Wacom booth #SL2525 NAB 2003 in Las Vegas. "A single pen does it all," says Michael Marcum, Senior Product Manager. "The CintiqPartner makes it easy to add a Cintiq interactive pen display to a computer system and efficiently use an existing monitor to maximize an extended desktop." The CintiqPartner can be easily configured to span the entire desktop consisting of a Cintiq and a traditional monitor. This makes dragging and dropping icons between the monitors very intuitive. "This is a great breakthrough for video editors, illustrators and designers who want the ability to draw and paint directly on the Cintiq as well as quickly get to palettes and tools on their other monitor," says Dan Casey, Visual Effects Supervisor of Vinton Studios, a character animation studio located in Portland, OR. The CintiqPartner has an active area of 6" x 8". The Cintiq Grip Pen controls the cursor in any application, offers 512 levels of pressure-sensitivity and provides pen-point precision whether used directly on the Cintiq screen or on the CintiqPartner tablet. The USB connection of the CintiqPartner allows installation on computers running either Apple Macintosh or Microsoft Windows operating systems. Priced at $199.99, the CintiqPartner will be available from the Wacom Direct website and Cintiq authorized dealers by the end of June 2003. A $50 manufacturer's mail-in rebate on the purchase of a CintiqPartner will be available to customers who purchase a Cintiq interactive pen display between March 1 and July 31, 2003. Offer expires on July 31, 2003. LCD Active Area: 11.9" x 8.9"/14.1" x 11.3"
Weight (Excluding Stand): 8.5 lbs./17.0 lbs. 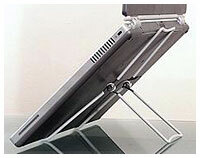 Photo Control has announced that a BookEndz Docking Station for the 12" PowerBook is in the works. BookEndz docking stations replicate all connectors and ports from the side of the PowerBook and route them to the back of the dock. The PowerBook 12" docking station is scheduled to ship in May, 2003. 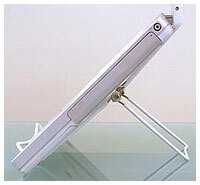 A BookEndz docking station for the iBook and several PowerBook models are available now. Berklee College of Music has posted its new computer requirements for students entering in Fall 2003 or afterwards. "For over a half a century, Berklee College of Music has been committed to preparing our students for the musical, technological, and business necessities of the world they will be entering. It has become increasingly clear that, to continue this commitment, Berklee students must be well versed in computer technology, and specifically, music technology. "Accordingly, beginning in Fall 2003 semester, Berklee College of Music will require all entering students to have an Apple Macintosh laptop computer. The laptop computer must meet certain minimum standards and must be outfitted with a software and hardware package designed to effectively support the first-year music education and coursework of students at Berklee. In addition, students who plan to pursue technology-heavy majors such as Contemporary Writing and Production, Film Scoring, Music Production and Engineering, Music Synthesis, and Songwriting should be aware that these departments will require additional hardware and software components. "Berklee uses Apple Macintosh computers throughout our curriculum because the Macintosh platform is widely used in the music profession and much of the software that supports our curriculum runs exclusively on the Mac platform. We are requiring portable computers, because we expect that students will utilize them in classes and labs. We are also expanding wireless access in public spaces around campus to the Internet, the Berklee library, Berklee online curricula, e-mail, and other services that will enhance the quality of our student's educational experience."